"The IEA and EIA reported that production outages in August tightened the global oil markets with..."
Podcast interview on Terror Attacks on Energy Infrastructure - A Growing Threat? 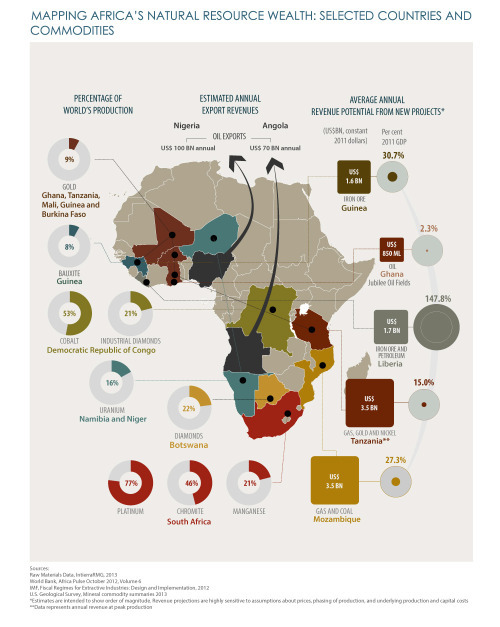 Africa Progress Panel released a report on the management - er mismanagement - of Africa's natural resource weath. The pic is a nice infographic visualizing the who has what' on the continent. Skimming the report I found myself asking: Is there anything surprising here? Nope - sadly, same old story of revenue mismanagement, no sign of trickle down, widening gap between rich and poor, etc. This is especially disappointing when one considers that between 2000 and 2011, Equatorial Guinea was the world's fastest-growing economy, with output growth averaging 17%. In 2012, Angola, Niger and Sierra Leone outperformed China; and Ghana, Mozambique and Zambia outperformed India. Yet, visit some of these countries and growth is hard to see. Sure, there are white elephant projects - like the building of skyscrapers or residential compounds that a majority of the public do not have access to - but the true signs of development - such as electricity and road infrastructure - are negligible. If we look at the poverty numbers, it seems there have been a few small strides. Tanzania, Mozambique and Ghana have all reduced poverty rates in the last decade, but there in each country the poverty rate is still over 50% of population. Despite increased growth in Cameroon and Mali there has been no effect on poverty and in Nigeria and Zambia poverty numbers have actually increased. But if we look at the true champion on the continent it is Botswana where natural resource governance has been more successful because they have built institutions and adopted legislation that establishes clear rules on the management of resource revenues, along with independent institutions that uphold those rules.This leads me to wonder: how can the Botswana (or even Chile) inform or inspire more strategic corporate social responsibility interventions in countries w/ high national resource wealth but history of mismanagement? Are there 'governance interventions' that multinational companies can make to help bolster and support institutional growth because it is in its strategic interest? 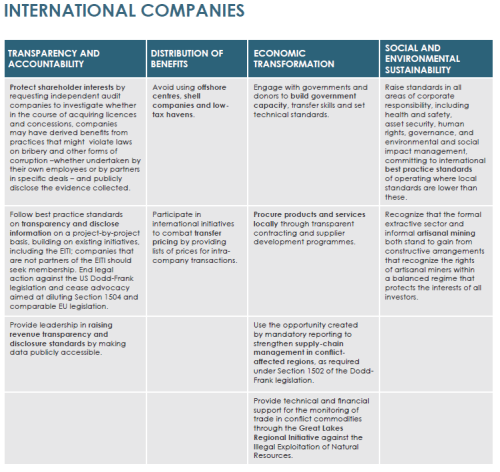 (Note: I include another pic from the report that summarizes the recommendations for companies). "British oil company BP said it is withdrawing some non-essential staff from Libya after..."
"Rear Admiral Ibok-Ete Ibas, a senior Navy officer, has warned pirates operating in the Niger Delta..."
"Syria's oil minister reports that production is down to 20,000 b/d from 380,000 b/d two years ago..."
"Iraqi exports dropped for the 3rd consecutive month largely due to sabotage to the Iraq-Turkey..."
"Nigerian government's gross revenue dropped 42% to $3.1 billion in July 2013 due to disruption..."